In the last seven months following the failed coup attempt, nearly 100,000 civil servants have been removed from their posts. That includes teachers, police officers, soldiers, academics and lawyers. The government accuses them of being members of terrorist organisations or groups seen as a threat to national security. Among them is a famous music maestro, a leading neuropsychologist aged 82, a well-known constitutional professor and a lecturer who was imprisoned for signing a petition denouncing Turkey's conflict with Kurdish rebels. Symbolic protests were held by students, academics and opposition MPs in the capital Ankara and in Istanbul, where sacked professors delivered lectures. How dangerous is Turkey's instability? 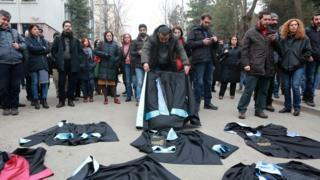 In some cases, academics laid their gowns on the ground protesting against the police blockades preventing them from entering universities. Photographs showed police trampling on their gowns, sparking a big reaction on social media. Eighty-two year old professor Oget Oktem Tanor, who founded the first neuropsychology clinic in Turkey, has been working as a guest lecturer in many universities. In Turkey's state universities, staff are classed as civil servants. But she says the government's sacking cannot be applied to her because she is not working under a government contract. "Advisers tell me I might lose my title as a professor," Ms Tanor told the BBC. "This is nonsense. It is an academic title. "They say I might lose my passport. OK, that's fine. They say my pension might be blocked. I cannot comprehend it. But, of course, they can do anything." Her students describe her as a hard-working, colourful character. They say she is tireless when it comes to teaching and sharing her knowledge and experiences. Ibrahim Yazici gave lectures in several universities in Turkey and has worked on the international stage as a conductor. Mr Yazici told the BBC he could not think of "terror and music together". "During the concerts I conducted after big terror attacks in Turkey, I always turned to the audience and emphasised the fact that terror aims to create fear in people," he said. "And we should overcome that fear through art. Especially in the times of terror attacks, art is holding people together." Sacked constitutional professor Ibrahim Kaboglu warned in December against the timing of the amendments to presidential powers in Turkey. This followed a state of emergency being announced after the military coup attempt in July 2016 which has been extended several times. He believes this means a fair public debate on constitutional change cannot take place. Last year Meral Camci was imprisoned after signing a petition of academics, objecting to violence in south-eastern Turkey. She has since been sacked as a civil servant, which prevents her from working in Turkish universities in future. She is now working as a guest researcher at Johannes Gutenberg University Mainz in Germany. "Neither when I was sacked from my job in Istanbul after 14 years of hard work, nor during my imprisonment have I felt what I am feeling right now," she said. "I am out now but I feel myself restricted and imprisoned." The government says the ones who were expelled have links to terrorist organisations including the Gulen movement, a group that President Recep Tayyip Erdogan accuses of being behind the coup attempt. However, critics - including many academics - claim Mr Erdogan is using this as an excuse to strengthen his position. Turkey coup: Who was behind Turkey coup attempt?